Then I shared with PB a story from René Descartes last book, The Passions of the Soul (1649). Descartes is speaking to farmers in his opening chapter about his Cartesian philosophy and the mysteries of life. The farmers protested: You're wasting your time talking to us. We don't understand philosophy. Descartes told them, The academians have too much pre-conceived notions and pride in accepting new knowledge. You folks are more in tune with nature, the change of the seasons, and therefore can discern God's mysteries much better. I always kept this story in mind while doing scientific research, and in meditating about life's mysteries and its grandeur. PB liked this story of Descartes. 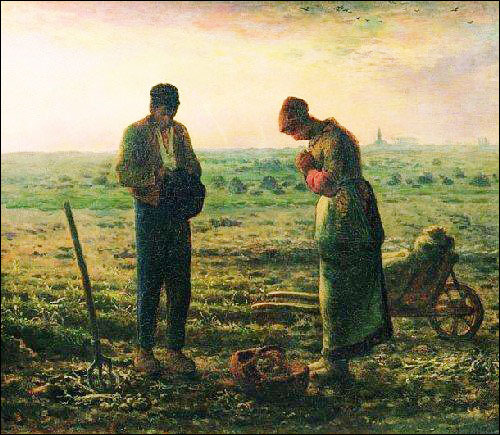 And everytime when I eat, I think of PB's prayer and Jean François Millet's L'Angelus.